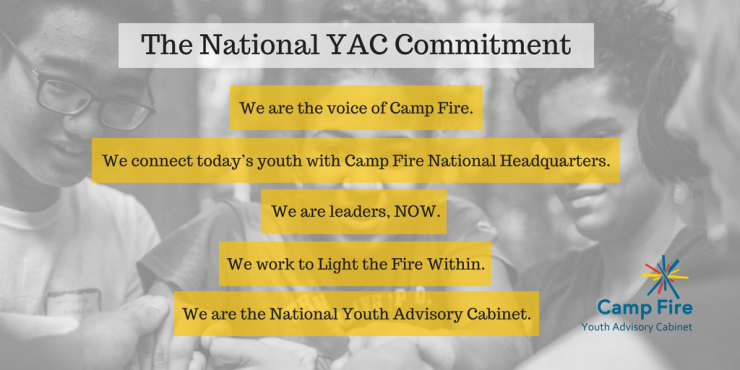 An Interview with McKenzie Napier, National YAC Chair and Camp Fire CO Alum! What is it really like serving on YAC? We asked McKenzie Napier, current YAC chair (and Camp Fire Central Oregon alum!) who was more than happy to let us inside the YAC experience. HOW DID YOU HEAR ABOUT YAC? I heard about YAC from my council’s [Central Oregon] camp director. She told me about it when I was twelve, and ever since then, it was in the back of my mind. I knew that as soon as I was old enough, I wanted to apply. DID YOU HAVE EXPERIENCE WITH CAMP FIRE BEFORE YAC? I’ve been involved in Camp Fire since elementary school. I was in a club and attended day camp. When I was old enough, I became a counselor-in-training and then a counselor. During high school, I earned my WoHeLo Award and served on my council’s board of directors. WHAT DID YOU LEARN AS PART OF YAC? YAC is a wonderful learning opportunity. Members in general get to learn what it’s like to be involved in the leadership of an organization. We also get to learn about marketing, fundraising, and everything that goes into running an organization. Being a member of YAC is a great way to experience the professional world (and start developing professional skills) before becoming an adult. WHAT SURPRISED YOU ABOUT YAC? I was surprised by how much independence we have. We set our own agendas, schedule our own meetings, and generally have a lot of freedom. I was so impressed by this when I first joined YAC because groups I’d been apart of up until that point usually had a lot of oversight. It really showed me what young adults can accomplish. WHAT HAVE YOU LEARNED ABOUT YOURSELF DURING YOUR TIME ON YAC? My time on YAC has taught me not to underestimate myself. I’ve been in situations that at first were intimidating, like leading conference calls, speaking with Camp Fire’s impressive leadership team, and presenting at Camp Fire board meetings. Each time, though, I was able to rise to the occasion. I think this is one of the greatest benefits of YAC. Members experience things that many young adults probably will not. We learn that we can handle these initially intimidating experiences, so we can go with confidence into our next adventures—wherever those may take us. WHAT HAVE YOU/YAC HELPED CAMP FIRE LEARN ABOUT TODAY’S YOUNG PEOPLE? One of the things YAC has emphasized is that teens need to know why an activity is important. We have so many demands on our time that we need to know why something is worth our time and effort. ANY FAVORITE MEMORIES OR PARTICULARLY TRANSFORMATIVE EXPERIENCES ON YAC YOU WANT TO SHARE? One of my favorite memories of YAC was the first Face-to-Face meeting I attended in Kansas City. Up until that point, I had only communicated with other YAC members virtually. As soon as we saw each other, it was just like meeting up with old friends. We had so much fun touring the Camp Fire HQ offices, holding in-person meetings, and doing an escape room [a live interactive game] that we came away more energized than ever to accomplish our goals. My spark is learning. I love finding out new things, whether through talking to people, reading interesting articles, or exploring new places. I’m excited to begin my freshman year at Washington and Lee University this fall. I’m not sure what my major will be, but I look forward to exploring many different subjects! HOW HAS YAC IMPACTED THE DECISIONS YOU’RE MAKING ABOUT THOSE NEXT STEPS? YAC has helped me develop a better idea of what different types of careers would entail. When I think about careers in marketing, fundraising, accounting, or management, I can picture the people working at HQ in those fields. I also know that I can reach out to these people if I have any questions or need any advice. This will be a valuable resource. WHY SHOULD OTHERS APPLY FOR YAC? YAC is a great learning opportunity. Members learn a lot about not only Camp Fire but also organizations in general, as well as what they themselves are capable of accomplishing. This is also a unique chance to have your voice heard. ANY ADVICE FOR FUTURE YAC MEMBERS? Like many things in life, you get out of YAC what you put into YAC. If you get involved and view new experiences as learning opportunities, YAC will be an incredibly impactful experience. McKenzie got you excited about YAC?